Learn how to make using storage simple with our hints & tips as well as our useful series on DIY videos for storage users. David, your local Storage King Manager and Greg from Miracle Movers show how to pack your items in to storage. 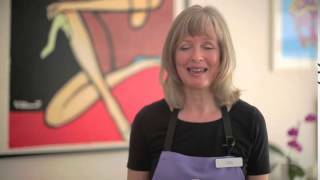 Ash, your local Storage King Manager and Jan from The Finishing Touch show tips on decluttering and preparing a house ready for sale. Check out all the items that The Three Birds choose to keep when they decide to renovate a house through Storage King! We love how the house is shaping up ladies! Ash, your local Storage King Manager and Jan from The Finishing Touch show tips on packing a house. Ash, your local Storage King Manager and Lynn from The Finishing Touch show tips on on getting ready to move and relocating. 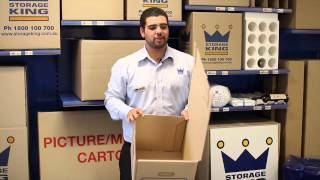 Stevan, your local Storage King Manager shows how to assemble a Port-a-Robe box. 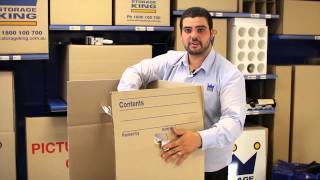 Stevan, your local Storage King Manager shows how to use and assemble an Archive Box. Fridges, freezers and other white goods should be thoroughly DRY and CLEAN before storing. Whilst in storage the door should be secured slightly ajar. A deodoriser placed inside fridges or freezers is also a good idea to maintain freshness. Don't place items inside fridges or freezers as the shelves and linings can be easily marked and damaged. Empty the contents of wardrobes, drawers and cupboards to protect the shelving and structure of these items. Clothing and personal goods should be packed in strong secure cartons with some naphthalene, mothballs or similar product to protect and maintain their condition. Where possible remove the legs from items of furniture e.g.. bed bases, tables etc. to avoid damage and save space. Vacuum food crumbs from lounges to prevent attracting vermin. Place a layer of packing inside the bottom and top of cartons containing breakables. Protect fragile items by wrapping them individually in packing paper (newsprint can be very messy and possibly stain). Nest cups and bowls, stand plates, saucers, platters, casseroles on their edges. Fill any gaps in the cartons with packing e.g. : scrunched paper or linen. This will keep your fragile items well protected and prevent them from moving around in the cartons whilst in transit. Label all cartons containing fragile items and avoid storing heavy items on the top of these cartons. These items should be protected by packing material e.g. bubble-wrap or in a flat-pack carton. Store them standing on their edges in an upright position (not lying flat). Wrapping silver in NON ACID tissue paper or plastic bags can help reduce tarnishing. Wipe chrome or cast iron with a little machine oil to help retard rust. Your electrical equipment is very delicate and sensitive and should be handled with care. The original boxes are ideal to repack in. However wrapping items individually in bubble-wrap, packing them in cartons, and sealing the top will offer protection for your electrical items. Remember to pack out any gaps in the cartons. Turntables and tone arms of record players should be secured to prevent damage whilst they are being moved. Pack records on their edges in cartons to prevent warping. We recommend that you remove the batteries to avoid damage from leaking Batteries. Computers, like your other electrical items, need special care. The original boxes are highly recommended for packing. However bubble-wrap and good quality packing cartons will do the job. Remember to use some packing or linen in the bottom and top of cartons. This provides extra protection to the contents. Pack out any gaps. Most modern computers have "self parking heads". If you are unsure about your computer, refer to the manufacturer's manual, or consult your retailer, especially if storing for longer than six months. As a general rule place large, heavy items that you can stack upon at the rear of the unit. Then work forwards and upwards with lighter, fragile items. Place those items that you may need to access often in the front of the unit. Depending on the goods you have stored, you may need to allow for walk ways. Packing in professional storage cartons will make the stowing and unpacking easier and safe, saving you time and worry. Professional packing and the storage accessories will provide your goods with the preparation they need for storage and maintain their condition for the term of storage. Any goods that are illegal, stolen, inflammable, explosive, environmentally harmful, hazardous, perishable or that are a risk to the property of any person. e.g. Chlorine, acid, paint and petrol. We can also assist you with insurance. Pay as little as $10 per month for peace of mind. Unsure what storage space you require?